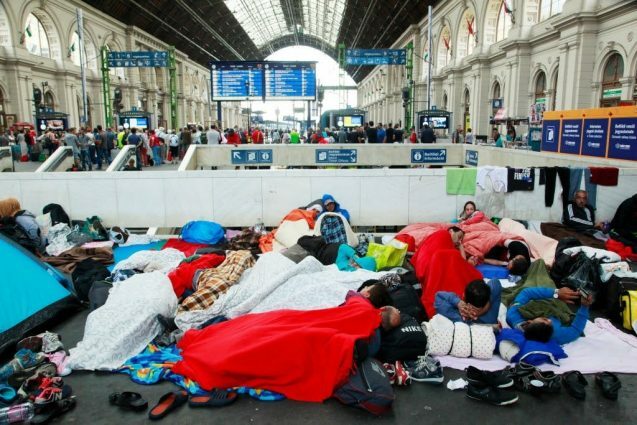 New research predicts that migrants applying for asylum in the European Union will nearly triple over the average of the last 15 years by 2100 if carbon emissions continue on their current path. 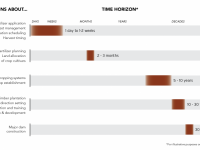 The study suggests that cutting emissions could partially stem the tide, but even under an optimistic scenario, Europe could see asylum applications rise by at least a quarter. The study appears today in the journal Science. Schlenker and study coauthor Anouch Missirian, a Ph.D. candidate at SIPA, compared asylum applications to the EU filed from 103 countries between 2000 and 2014, with temperature variations in the applicants’ home countries. They found that the more temperatures over each country’s agricultural region deviated from 20 degrees Celsius (68 degrees Fahrenheit) during its growing season, the more likely people were to seek refuge abroad. Crops grow best at an average temperature of 20 degrees C, and so not surprisingly, hotter than normal temperatures increased asylum applications in hotter places, such as Iraq and Pakistan, and lowered them in colder places such as Serbia and Peru. 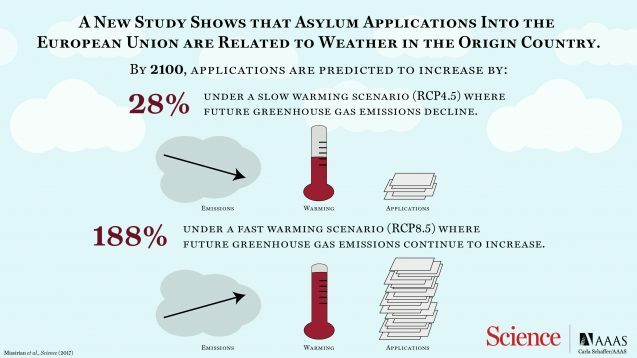 Combining the asylum-application data with projections of future warming, the researchers found that an increase of average global temperatures of 1.8 °C — an optimistic scenario in which carbon emissions flatten globally in the next few decades and then decline — would increase applications by 28 percent by 2100, translating into 98,000 extra applications to the EU each year. If carbon emissions continue on their current trajectory, with global temperatures rising by 2.6 C to 4.8°C by 2100, applications could increase by 188 percent, leading to an extra 660,000 applications filed each year. Under the landmark climate deal struck in Paris in 2015, most of the world’s nations agreed to cut carbon emissions to limit warming by 2100 to 2°C above pre-industrial levels. President Trump’s recent decision to withdraw the United States, the world’s second largest carbon emitter, from the accord now jeopardizes that goal. In a further setback to reducing U.S. carbon emissions, the U.S Environmental Protection Agency has proposed lowering the U.S. government’s “social cost” of carbon, or the estimated cost of sea-level rise, lower crop yields, and other climate-change related economic damages, from $42 per ton by 2020 to a low of $1 per ton. The EPA partly arrived at the lower figure by excluding the cost of U.S. emissions on other countries, yet as the study shows, effects in developing countries have clear spillovers on developed countries. “In the end, a failure to plan adequately for climate change by taking the full cost of carbon dioxide emissions into account will prove far more costly,” said Missirian, a fourth-year sustainable development major. The research adds to a growing body of evidence that weather shocks can destabilize societies, stoke conflict and force people to flee their home countries. In a widely-cited 2011 study in Nature, a team of researchers led by Solomon Hsiang, then a graduate student at SIPA, linked modern El Niño drought cycles to increased violence and war globally. More recently, researchers have highlighted the connection between the drying of the Middle East and ongoing conflict there. In a 2015 study in the Proceedings of the National Academy of Sciences, another team of Columbia researchers made the case that climate change made Syria’s 2006-2010 drought two to three times more likely, and that the drought was a catalyst for Syria’s 2011 uprising. The civil war that followed has so far claimed 500,000 lives, by one estimate, and forced 5.4 million Syrians to flee the country. Germany has taken in the largest share of asylum-seekers from Syria and elsewhere, but increasingly faces a backlash from German voters worried about assimilation and loss of jobs. A wave of anti-immigrant sentiment elsewhere in Europe has led to Hungary building a wall to keep refugees out and influenced Great Britain’s decision to leave the European Union. In the United States, President Trump was elected in part on his promise to build a wall to block Mexican immigrants from entering the country illegally. The U.S. Department of Energy provided further support for the study. Study: Asylum applications respond to temperature fluctuations.